Belinda says ‘jump’, I ask ‘how high’? | darkness overcomes you . . .
Belinda says ‘jump’, I ask ‘how high’? Months ago my daughter told me how much she enjoyed listening to Brad Beer’s podcast, The Physical Performance Show. I listened to a couple of episodes, but I guess I wasn’t sufficiently performance oriented at the time to keep it up. I mostly chose classical music instead to accompany my running. Actually, I haven’t been doing much running at all, largely due to sustaining a couple of vertebral osteoporotic fractures in late 2016. I was surprised that I had osteoporosis. After all, I’d been active my whole life and consumed a lot of calcium when I was younger. Anyway, now I am a vegan I thought I’d better start calcium and vitamin D supplements, and hope that maybe that would help restore my vertebral bone strength. I also decided to put on some weight (I heard once that obesity offers the best protection against bone loss). 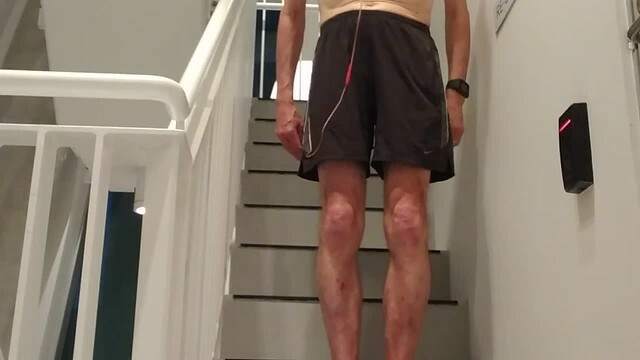 When I started to become more active and begin running again this year, my proximal hamstring tendinopathy returned and I had to do stair climbing as my mode of exercise. To relieve the boredom of going up and down 11 flights of stairs, I listen to podcasts. My daughter, who knows about my osteoporosis (and is probably sick of hearing about my health woes), told me that her old friend Brad Beer had recently hosted a podcast episode featuring bone scientist Professor Belinda Beck. Not expecting too much, I decided to see what Professor Beck had to say on the topic. Wow! I was really surprised at what a good interviewee she is. For me, anyway, she pitched her message at just the right level. She obviously has great expertise, but also a wonderful ability to summarise the current research literature on bone health to a message relevant to Physical Performance Show listeners. Interestingly for me, she spoke about how a chronic energy deficit (e.g. from running a lot and not eating enough to make up the energy loss) can lead to osteoporosis in even the most active person. I think this has been my problem. OK, Belinda, I’m up for it. Not sure how high I should be jumping, but I decided to jump down the last two stairs of every flight from now on. Not just in my morning half hour of stair climbing exercise, but every time I go down every set of stairs I encounter. Starting now. This entry was posted in emotions, health, injuries, running, work and tagged Belinda Beck, bones, Brad Beer, daiskmeliadorn, exercise, osteoporosis, physical performance. Bookmark the permalink.